We've had these (or very similar ones) installed last week in a basement corridor and in front of lifts in the building where I work. Yeah, they're unnecessarily (absurdly) bright. You almost need sunglasses to pass that place. I can imagine the thinking of those who have chosen them. Say there had been worn 2x 20W CFL in dirty and yellowed downlighters before. "Hey - the light here... let's make it better. We need to double the wattage!" "Look at those 80W LED downlighters - let's put them here!" But they forgot the CFL were worn out, the fixtures were all dirty and yellowed and the LED efficacy is 2 times higher than CFL and throws all the light down without reflection losses. That way they haven't doubled the illumination level but could possibly made it like 10 times higher - far beyond the needs of everyone and causing the eye strain. I don't think the LED panels at my place are particularly glary - the diffusers work well. But even if I look down (even if I had a baseball cap on my head), the floor and the walls are still insanely overlit. It's almost as if you stepped out from a dark room to a summer midday outdoors. I think all the light sources strong enough would cause about the same eye strain. As for the LED spectrum (for the others) - it's improved a lot since the humble attempts to make white light like 7 years ago and before. My parents still have such an old corn LED in their bathroom (meaning toilet) and it's indeed a light that could make you to throw up. Most people here now have LEDs at home, in their offices, in their laptop screens or smartphones and quite happy with them (if they last long enough...). That's right but I said the luminaires weren't in my view. The problem isn't that I can't see well because I'm blinded by some glary lights. Problem is there's too much light at once and the eyes have to adapt to it immediately. The LED spectrum is less desirable than that of most discharge lamps becaue of how it is distributed. Sorry that's difficult to imagine. Sounds like an oxymoron. That's like if colours didn't respond to the light spectrum. 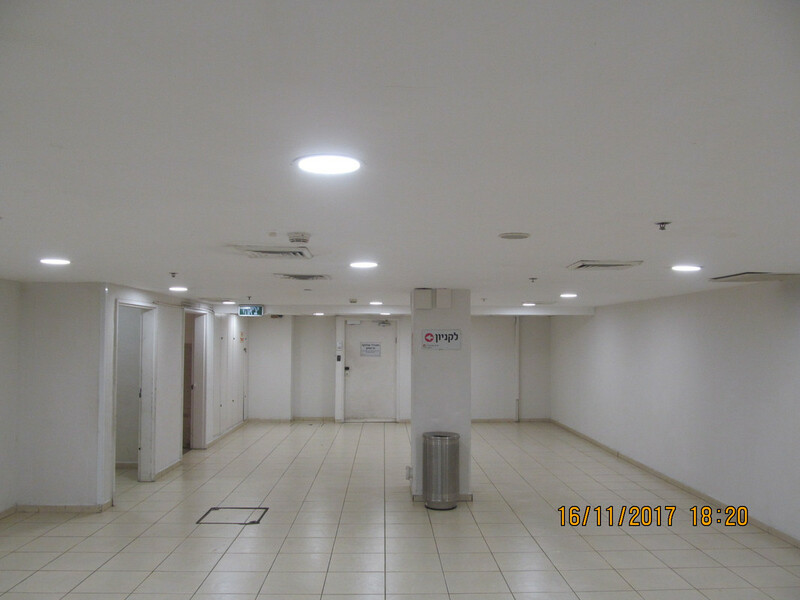 These LEDs are located at the parking lot and near the elevator of Azrieli Haifa mall, Ash. This isn't at the Cinemall mall. Problem is there's too much light at once and the eyes have to adapt to it immediately. Lots of imaginations and theories, sorry. The only correction our brain is capable of is an "object to colour dictionary" it has recorded through experience. It's unidirectional - it can translate a tomato to red, a carrot to orange and your brown shoes (since you know they're brown) to brown. It doesn't work in reverse - a small sample (if not characteristic by it's texture but only by its colour) can't be translated to an object. A small visible pieces of a brown polished leather and a tomato may not be discernible under some light (say a SON lamp). If you are able to pair socks (from a heap after washing and drying) with similar colour shades under SON light so that they will really match under sunlight, your brain must be supernatural. I like your sound analogy. Imagine a crappy component (PA, headphones, ...) that would make +20dB bumps - say at 200Hz, 700Hz and 3000Hz and suppress by -20dB the rest. You listen to your favourite music so you know - here should be this, there should be this and this should sound in a very different way. You can "compensate" by your knowledge but... would you really enjoy such a distorted sound? Install Audacity and try that. The same situation is with low CRI lighting. Incandescent lighting could be like small speakers suppressing bass sounds. Not great but still more acceptable than so much distorted sound. A couple of years ago I spoke with a guy who had been working night shifts in a SON floodlights only lit factory hall. While he only assembled colourless metallic boxes (operations like cutting, punch bending and spot welding), he told me that staying in such a hall for 8 hours was pretty nauseating. It was a great relief for him when they moved to another hall, lit by MH highbays. It's pointless to replace perfectly working HPS street lanterns in a good shape with LEDs. Just to replace them. But if you don't need to mix light colours & have LED lanterns proven as reliable & have LED lanterns for reasonable price - then it's also pointless to do new installations with worse quality lighting.